I have that Time Warp! Nice. Working on those anthology comics was a great way to learn the craft of comic book writing, Bryan; and it also gave me a chance to see my stories illustrated by folks like Kane, Steve Ditko, Tom Sutton, Don Newton and many other incredibly talented artists. TIME WARP and its (kind of) spin-off MYSTERY IN SPACE were special favorites. Part of me would love to go back and rewrite those stories -- I was brand new to the business and had SO MUCH to learn as a writer -- but the stories have to stand as they are. As a child of the '80s who rarely had the cash to spare for a comic book, I didn't get to buy comics regularly until around '91 or '92, when my family's financial situation improved enough that I could get a weekly allowance. Therefore, my first exposure to Gil Kane's work was not in classic issues, but some of his fill-ins on the various Superman books. I loved his art instantly. It wasn't flashy like the artist flavors-of-the-month, but fortunately, I had gotten to the point where I was no longer impressed by flashy artists with no true craft. That Kane was a master was immediately apparent to me, and I set about trying to find some of his older work. It definitely wasn't easy in those pre-internet days! He's remained one of my favorite artists to this day. 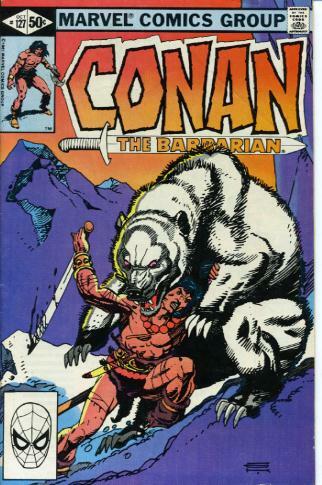 I've been gradually working my way through all of the Marvel Conan comics for the past five years or so-- I must admit, I focus mainly on the Savage Sword magazines-- so I have yet to get to your Conan issues. I'll have to jump ahead and check 'em out. That one of the issues adapts "The Frost Giant's Daughter," one of my favorite REH yarns, is a nice added enticement. Just to clear something up, Waylon: the story I mentioned isn't an adaptation of "Frost Giant's Daughter," it's a story that was inspired by "Frost Giant" in the sense that I was going for the same otherworldly tone and feeling. There is, of course, a brilliant adaptation of "Frost Giant's Daughter" by Roy Thomas and Barry Smith (I think it was originally done for a black and white magazine then reprinted, in color, in the CONAN monthly) -- and it's as perfect an adaptation as I've ever seen in comics. As for Kane: you're right. Nothing flashy about him. He was pure elegance, power and grace. He didn't need to be flashy! If you track it down, Waylon, let me know what you think. At the very least, you'll be treated to some great art! Pairing young writers with veteran artists is a great way to go. I was reading an interview with Mark Waid the other day, and he was talking about how great artists function as editors, too. Glad you got to work with Kane! You and me both, David! I'm not sure an artist better represents a pre-marvel Silver age than Gil Kane. It's no wonder he worked on Green Lantern. And, I by no means wish to diminish his work post 1961, but Kirby owns that era, and he did what he did. However the crisp clean art of the atomic age, adn jet age... that's Gil Kane's era. That era of his work almost looks (if almost) like that same time periods drawings of the worlds that could be. Something tells me that if one could ask him, those sci-fi magazines of yester year and stories in magazine about the "world that will be" were at least partially influential. It would be interesting to see what sci-fi anthology tales he worked on. We'll have to disagree a little about that "post 1961" idea, Jack—but I get what you mean about his art being perfect for that 50's-early 60's atomic age. 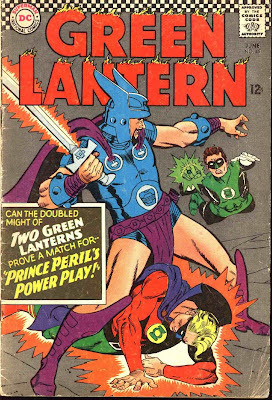 Still I'm LOVE this Marvel work of the 60's and there was a point on Green Lantern where, inspired by Kirby and the Marvel revolution, he really cut loose and did some of his best work. But then he pretty much continued doing his best work for the rest of his career. If I may clarify my response, I did not mean to imply that 5he 50's were his best work or that he didn't continue to get better. No, I simply meant that he owned that era of the 50's. My favorite of his drawings was the kid stoned out of his gored in the famed comics code free tale, and Mary Jane looked amazing under his pen (on stage in those issues). And these are just image stuck in my head too, no going back to look stuff up here. Think of it like the Beatles (I know Stan and Jack are the Beatles of comics, but go with me here and think Beatles = Gil Kane)so those mop-tops may have owned the early 1960's but by the end of the decade so much had changed and music had changed so much that they were no longer the only ones revolutionizing music, and there work even got better, but it was all so diverse by that point it is hard to say that they necessarily "owned" the era. Okay, so it isn't a perfect comparison, but still good enough right? And if you don't mind, you have peeked my interest in something else. You mentioned Kane inspired by Kirby, right? Don't worry you did. So then, what folks influenced you after you had started in the field? You've talked about the Lenends of Stan and Jack, and Eisner. And, you have talked about 70's mainstays Englehart and Gerber. However, I'd like to know what writers came in with you or just before you or just after that inspired you. P.S. only 11 more days until issue one of the Lost Gerber Man-thing story! Yes, Stan, Jack, Gerber, Eisner, Harvey Pekar, Englehart. Gardner Fox and John Broome, who profoundly enriched my childhood and my imagination. Len Wein, both as a writer and as one of the finest editors (and finest humans) I've ever worked with. (SWAMP THING and Len's brilliant, under-appreciated run on JUSTICE LEAGUE spring immediately to mind.) Doug Moench's MASTER OF KUNG FU work. Marv Wolfman on DRACULA. Jim Starlin's CAPTAIN MARVEL and WARLOCK. Roy Thomas. (Roy is the bridge between Stan, Jack and Ditko and all the young turks who followed. He really deepened and expanded the universe that Stan and Company created.) Denny O'Neil on BATMAN and GREEN LANTERN/GREEN ARROW. I'm sure if I kept at this I'd come up with many more—but I'll stop now! VERY cool, Jack: thanks for the link!! Well, of course it is, it is an interview with "The Gerb." I especially found his views on Giant-size Man-Thing #4 interesting... of course his views on Defenders were interesting as well. It's funny though, how even though hes seemed to like the story in G-S M-T 4, he felt a need to apologize for it. Weird, especially since I can't help but wonder if it would be considered as much of a classic if he'd done it how he imagines. Another interesting thing is his mentioning of the diverse story-telling of the time, and indeed there was. But he also said there were 30 books being published, were as for the past decade or so marvel and Dc both publish far more than that, and it seems that (with the exception of my previously recomended titles) both companies seem to be getting more and more homogenous in style. And thank you for the list of inspirational creators. Starlin is the mios interesting though, not because I don't think he would mix with you and certainly not because I don't enjoy his work, fact is I love it. Rather because his tales, especially the cosmic ones, tend to be more cynical in tone, and as darker as your stories 9 times of of 10, if that rare, your stories have a ore shiny silver lining it is only like a balancing act. Moench's Kung fu was great, maybe the best espionage comics ever. And his Moon Knight run had some of the best Batman stories ever... and then tere are his great Batman runs. However, and agian very appreciative of that list, I was some what more interested in the young turks who followed you that you enjoyed, and how they affected you. Thank you for your time. Hadn't thought about a Gerber-centric post, Jack, but it's not a bad idea! Re: Starlin. It's been a long time since I read those stories, so I don't really remember the cynical tone you're talking about. 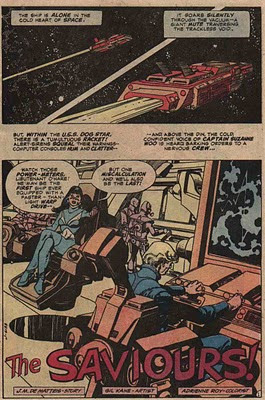 What I do remember is that Starlin took the vibe of Kirby's Fourth World and ran with it, creating comics that were smart and cosmic and very much his own. The kind of comics I was able to give to non-comic book reading friends with a taste for fantasy and SF and say, "See? This stuff is GOOD." As for "young turks" who came after me...I've enjoyed so many wonderful stories by so many wonderful creators -- David Mack's KABUKI and Joe Casey's GODLAND spring to mind as more recent examples -- but I can't say that there's anyone in particular who's influenced me. That said, I'm INSPIRED by ANY writer or artist who is in full creative swing. That energy is infectious. Whenever I read a terrific story, it makes me want to run to the computer and create. Of course it was a good idea, note the source. But, do me a favor and refer hom as "The Gerb" I'm trying to get it to catch on. 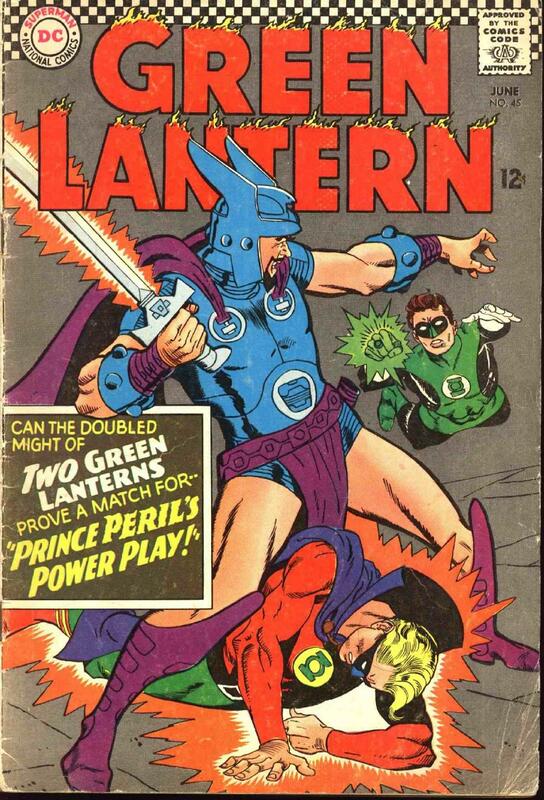 As far as Starlin goes, I always detected a cynical edge to his work. Starting with Warlock, who essentially had to commit suicide to save the universe. And this was not his only foray into such territories, there was also a Hulk magazine story which dealt with this subject (though admittedly I have not been able to track down a copy), and in the first issue of "Cosmic Guard" a 12 year old contemplates such notions as well. Thanos is without a doubt his most famous creation, and his whole goal is to wipe out life... in the name of love. And don't forget that Warlock had to ally with ol' Thany to defeat his own dark self which was ruling an evil religion, that was essentially unavoidable unless, and here we go back to the suicide thing. Thanos even wiped out the vast majority of his own species. Dreadstar's first tale involvrd a species that ate it's own young, and ended with the complete and utter distruction of the Universe, which only reminds me that Thanos once succeeded in wiping out half of life in the universe. And Starlin's run os Silver Surfer in the 90's (which was really good if you haven't read it) involves a mini series which reveals that Surfy sees Warlock as a cold almost empty being after his Adam's resurrection. And let's not forget Drax was a characer (orignaly intelligent but still...)completely obsessed with causing the death of one being. And moving beyond the cosmic, Starlin also wrote a tale just before "a Death in the Family" where the readers and Batman himself were left asking, "Did... Did Robin just kill some people?" Also his BAt-run ended with a story that reveals Bruce Wayne told his father angrily that he hopes Thomas dies, and had villian who was a very realistic, very disturbing serial Killer, who. And let's not forget Batman seemingly leaving a vilian to drown. Of course the famous bat run also had Batman #423, which was a very everyday-heroic take on Batman. Even if you don't agree with me about the cynical edge to Starlin's work, I hope you at least see where I could get the idea. And don't ge m wrong, like I said, I love his work, and this just reminds me that I should have put his "Infinity Abyss," "Marvel Universe: The End," and "Thanos" as recomended reading from the last decade, I knew I'd forget one. And as far as later joining wirters inspiring you... There was no looking and Frank Miller's Daredevil and saying "I CAN tell darker tales if I want," or DKR And saying "it's a whole new world... my adult work isn't just for epic any more." No Mark Waid MAking you think, yes... I don't have to be fearful that Silver age-heoics will cause A script not to be sold." Well, I've heard "Frank Miller really let me off my chain" or "WatchFce really opened a door" stories a million times. Well, I'm actually a little relieved. And hey you definetl;y didn't need any further inspiration in my book, you are a top writer to me and always will be. I was just curious and hey, a good story can always inspire you to say "hey that was a great story, now I wanna go write a great story." And I think that sentiment is what you were going for anyway. I hear what you're saying, Jack. Perhaps the word pessimistic would be more applicable than cynical. In the end, EVERYTHING we read -- even the stuff we don't like -- goes into the unconscious and influences us in some way. Often without us realizing it! Perhaps it's merely pessimistic at times, and cynical at others. The Thanos-Lady Death Love jive to me seems like a pretty cynical view of what intense affection can lead to. But, hey... a little cynicism is needed by people, especially these days. But if you see it more as pessimism than cynicism, then I can defenitly see where you are coming from, and even agree with it to an extent. And as far as ol' Miller and Moore go, I'm glad to here that. Hearing that either pushed you to much into this direction or that would have crushed the myth. I always thought Moonshadow should be at least, at LEAST listed among those two in terms of impotance to comics... and unlike Kingdom Come(which is often mentioned in the same breath)Moonshadow occupies the same relative point of publication. But I know it isn't a superhero story, so it is off on it's own. And beyond that, As much as I like Frank Miller and DKR, I always thought Daredevil: Born Again was his crowning achievent in comics. DKR was the most different superhero story he told, not necessarily the best. I often think writers of the era verbally jumble up what they mean in talking about DKR and Watchmen. They always say inspired when in reality it seems more like they mean let them off of there reigns. And as far as Watchmen goes, I always thought it was a bit on the over rated side. Not bad, but definitely over praised. I personally always saw it as the comic you right in your head and doodle in your notebook when you are sitting in english class, when you're 15 years old and you hate the world. And there is nothing wrong with that, that idea was tapped better in those then most people doing that could have birthed the tale. I just... look I can on and on abouth this subject, and will if asked by anyone, but that is not what this is about, and I think the book is fairly good. It is interesting we find ourselves at this point of discussion, having followed this thought process, even if I did accidentally take us here (and it was an accident, I just meant those names as examples) Because Those two books get a lot of credit for spawning darker tales, but "The Gerb," Englehart, Starlin, and yes even that Dematteis-guy told there far share of dark tales a good decade before hand, and they were arguably even darker. Just goes to show you comics are a rich tapestry, and have been moving forward since 1961, and that 1985 wasn't the shock people claimed it was. So after all this rambling I'll just summarize and say, I'm glad to here Dematteis caused Dematteis to evolve. And, finally, I find it funny that you mentioned Alan Moore for visual basis. This is odd, because FRank Miller is in at least one way the truest heir to Eisner... he is a cartoonist. I don't mean that in a derogatory sense, but rather in a form of High praise. Miller and Eisner both worked with words and art not as two separate entities, but as the same beautiful dance. Once again, glad to here it was Moonshadow that advanced you to a new state of writing consciousness and not an out side influence. Not that would be anything wrong with that, just you know. God, I hope I've made myself clear here and don't come off as a jackass. You were perfectly clear, Jack -- and expressed yourself eloquently. Thanks for sharing your insights. The thing to remember about MOONSHADOW is that just about every influence I ever had -- from J.M. Barrie to Kurt Vonnegut to Ray Bradbury to Lee, Kirby, Gerber, etc. -- came to bear on that book, but, in synthesizing those influences, I found my own voice and the bravery to push off into new territories. And I think the key to doing that is writing stories that are deeply personal. Despite the fact that MOON is an outer space fairy tale, it was, at the time, the most profoundly personal piece I'd ever written. As I tell my writing students, writing from the core of your heart, being fearless and shameless about exposing your deepest thoughts and feelings, is the key to powerful stories. It's also the key to finding your own identity as a writer. And as I say to my students, "Why are you in my home? I don't have any students!" I need a better locksmith. P.S. thanks for the kind words in reference to my post. Speaking of KLH, it's just been voted the greatest Spider-Man story of all time at CBR! I love the recurring gravedigger motif, especially with big payoff at the end. KLH is pretty intense, but I don't see it as pessimistic. Kraven ultimately makes his choice--a very bad one--and Peter still triumphs by refusing to give in to his primal fear or anger. The scene where Peter and Vermin come out of the sewers and into the sunlight is the like the voice of God! It's because KLH is so relentlessly dark throughout that the final moment is...well, so beautiful and uplifting. More so than it ever could have been if you'd let up on the poor guy up until that moment! That's the trick, David: Go down into the dark but always come back up into the light. For me, it's vitally important that the reader is left with a sense of hope and the value of simple human decency. Very gratified that KLH was the #1 pick; but it's important to remember that (aside from Vermin, who was a DeMatteis-Zeck creation) all those characters came from the fertile minds of Lee-Ditko-Romita. Without them, we're nothing! Yeah, I think readers and writers alike owe a lot to Lee-Ditko-Romita. Actually, their influence has now permeated pop culture in such a powerful way that they're influencing people indirectly. As far as Kraven goes, I think you enriched his character in a way that made him much more interesting than he'd been before. He wasn't one of the stronger Lee/Ditko creations, but you saw the potential there and ran with it. And when you did, it felt right, like it'd been there all along right under our noses! Thanks, David! I love looking at characters that people have written off or taken for granted and then digging into their psyches in an attempt to figure them out (and make them more interesting). In my writing class I talk about The Big Why. For instance: WHY would a guy put on leopard skin pedal pushers, grab a rifle and go around chasing Spider-Man? What happened in his childhood to twist him? What traumas have rocked his life? What demons are haunting him? You start asking those kinds of questions, you can make almost any character interesting. So, the big day has come and gone. Did you pick up the lost Gerber Man-Thing? If not, it was very well done. My personal guess is that Gerber submitted this to Marvel awhile ago, but long after his stint was over and done. My guess is that it was planned as a "Marvel Comics Presents" story or maybe even "Marvel Fanfare." The writing holds up well, the art is good... except for (oddly enough) old muck-face himself. Best buy of the week. I don't want to over hype, and there were certainly better Gerber Man-thing tales, but this keeps the traditions strong. Haven't read it yet, Jack. (No nearby comic shop.) But I'll do my best to seek it out! Thanks for keeping e updated on this! I figured as much, though for entirely different reasons. While comic shops are no where near as prevalent as they once where, I figured not going to a comic shop would be more to do with your profession. After all I would think there would be some kind of mobbing of you, and I am not kidding. And with all the "hey, could you sign this Moonshadow 1 and this Amazing Spider-man 400 so we can tack on an extra 10 bucks? No? too bad you don't get a say." But, I checked out the site (this site) to see if there was a new post, and upon doing this I read some of the previopus posts and saw there was quite a bit of hyping of this project, largely by me. And decided to be the Canary in the Coal mine on this one. After there hours of enjoyment you've given me it's the least I could do, plus you know... comic readers want to talk comics. Be forewarned though, I did find it a tad aggravated to be reminded of how homogenous modern comics seem to be some times. And how bat a hand for the ever Gorgeous-voiced Lisa Marr? Not your thing? Is your thing? Whatever, either way you got to spread quality around, I do it for J.M. Dematteis and I've started doing it for comics as a whole (I recently realized that we readers have gotten a tad complacent). Wow, I'm rambling more than usual... I must really be tired. I don't get mobbed in comics shops, Jack: it's not like people recognize me when I walk in. On the rare occasions I go to a shop, I'm free to stroll around and look at all the goodies. I just don't do it very often. Listening to the Lisa Marr song now; very nice. Very glad you've been the "canary in the coal mine" re: MAN THING. I'm not really up on current comicd, so I appreciate knowing what's out there...especially where new Gerber stories are concerned! You just had to kill the myth didn't you Dematteis? I was picturing a whole "Hard Day's Night" thing going on, only you know with more allergies and tapped glasses. But I am glad no one is getting mobbed, it does not seem fun. I don't know why I thought that you would. Just one of those great mysteries of life, like how a child would possibly think a monster could get into his closet, or how Paul McCartney gets all that pigeon blood to stay looking so young. And, I am more than happy to be that Canary, after all, I always wanted wings and I enjoy dark places with risk of collapse. And even though I have no plans to stop buying comics as close to weekly that I can manage, God knows I've been burned by new releases with no word of mouth. But really did it for me, you see most people I know don't read comics, and the ones who do, I mostly won't see until Wednesday (and even most of them didn't buy it), so thank you for indulging me. That was appreciated. And as far a Lisa goes, I am glad you enjoyed her. I think I may have posted a link to a video of her here quite a while ago,. but God knows I can't remember (come on a lot has probably happened). But I truly believe that if you enjoy something, you shouldn't horde, it and for some unknown reason I got the wild hair to pass on this talented songbird. If you don't share what you enjoy and horde it for yourself, that is tantamount to being a hipster, and all that irony is way too much pressure. I'm even trying to get my sister-in-law reading comics (she has two Dematteis gems in her borrowed four or five). But anywaty,I think Ms. Marr is amazing, and I hipe you can appreciate why I made such n odd decison. and on the off, off chance you or anyone else would want to hear more, herer is alink tosome of her other songs http://lisamarr.org/press/, and http://lisamarr.org/press/index-QTs.htm . Though I am 97% sure a night shift and lack of sleep played th lions share. Love the HARD DAY'S NIGHT image, Jack: I'm running down the street, pursued by shrieking comic book fans, while a George Harrison chord echoes across the world! I will indeed enjoy myself. Have a great Sunday!